\subsubsection in Report/Book Class Latex. We some time need to use \subsubsection when writing reports/books in latex. Although this kind of use is rare its still sometimes required. By default subsubsection will not be numbered in book or report class. to the preamble, and you will see the subsubsection is now being numbered. Basically the above line instructs latex to use 3 level of numbering instead of default 2 (chapter -> section -> subsection). Windows 8 consumer preview is out and can be downloaded form internet. Unfortunately some of the functionality breaks behind proxy servers (which hopefully will become thing of past). I got error code 0XD000005E when trying to connect my Microsoft Account with Windows 8. The problem is actually with the proxy settings (not all locations use IE settings by default :() Setting the same from command prompt (Running as ADMIN), using netsh command will do the trick. 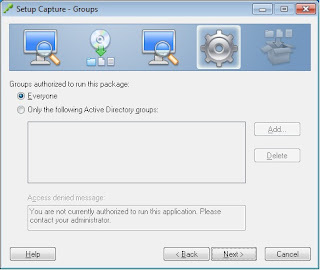 The last step will import proxy settings from ie and use them for all applications running system wide. Same also holds true for earlier versions of windows, but as they were not that connected to the cloud, it just seemed to work. 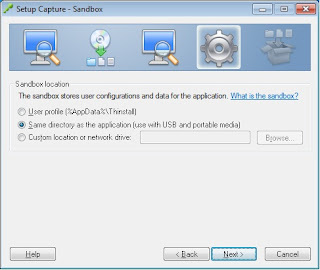 Setting the proxy settings this way will ensure you can always access the online account(windows store, calender, mail etc). 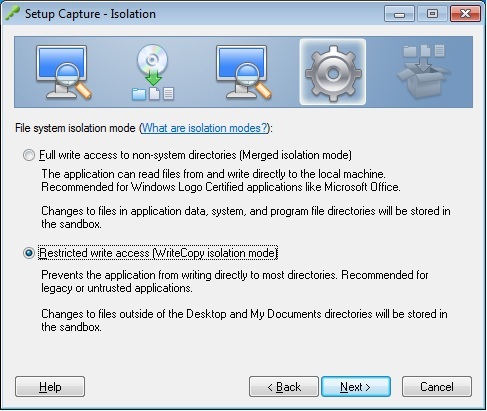 Right Click Slow in Windows 7 ? Recently i started facing a peculiar problem with Windows 7, my right click context menu started taking forever to load. Unfortunately this was due to faulty shell extension by PowerIso or Tortoise SVN (I dont exactly know which one, but enabling either one gave problems so i assume both were giving some problems in Win7 64bit). Right click slowdowns are caused by improperly coded shell extensions which load when we right click. Disabling them do the trick. 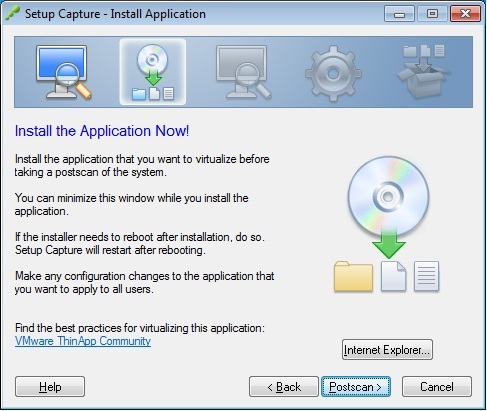 Please follow http://windowsxp.mvps.org/slowrightclick.htm for more information on the same. Although searching for individual misbehaving extensions is better. This post is about update problems with avast 7. I have been using avast from past 8 yrs and believe me I have been fully satisfied with it. Not a single instance of malware infecting my computer in-spite of numerous tests that i do daily (now a days i have shifted testing to vmware mostly). 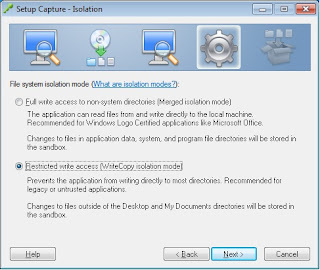 "Error accessing data files in ***** (Avast folder name)"
And on running the full setup apart from above error i got error "(Setup failed error ****)"
and reinstall avast to solve the problem. Although i am still facing issues with mail shield. Will report back if I get solution from avast team. This post is VLC player 2.0's review. VLC Player 2.0 was just released a day ago and i can see the clear benefits in video quality. Also better usage of multicore systems have lead to faster video rendering without stressing the graphics card much. Unfortunately VLC no longer supports 400 % volume by default. Also sound quality is a bit poorer than previous version at-least it seems to me. They have removed this functionality. The subtitle sync can be improved and be taken up to the mark of GOM player. That all for now. Will soon catch up with more reviews as i use VLC Player. Internet Connection Sharing, some issues and solutions ! I am writing a blog post after long time, hope you enjoy it. I recently faced a small issue in Windows 7 64-bit Ultimate. I wasn't being shown the "Turn On internet connection sharing" prompt when creating WIFI adhoc network. I assumed that somehow ICS has been disabled. But it was just the opposite. If you set the set "Allow other network users to connect through this computer's internet connection" option in Adapter properties, then ICS is enabled by default and no new prompt is required. Hope this resolves the issues that isn't there. :) :P . I couldn't find a blog or write up on the same so i summarized the contents here. Disclaimer :- I don't support cracking/bypassing any software in any way. The information is for educational purpose only, use at your own risk. 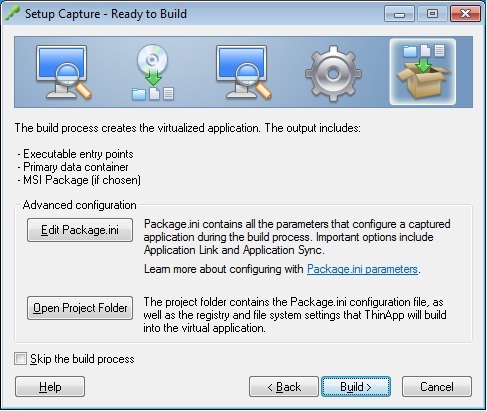 This post will explain how we can use vmware thinapp and run any trial application forever with little hassle and outside help. 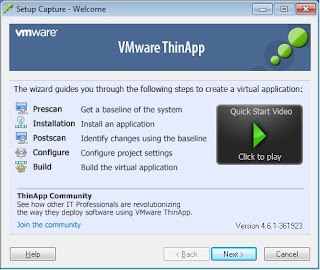 You will need Vmware Thinapp (and Vmware Workstation/Player for using this). There me be other free alternatives but i have not explored them as of now. 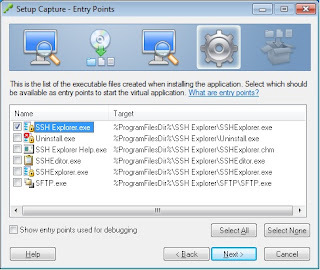 I'll give example of using SSH Explorer for demonstration.Please see disclaimer, and buy this software if you like, it will help fund many software engineers around the world. 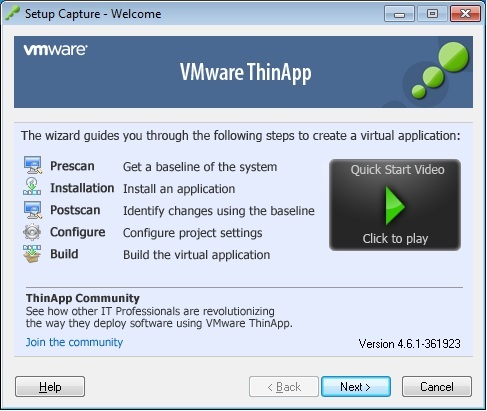 I have windows 7 installed in Vmware Workstation, with Vmware thinapp installed on the same. 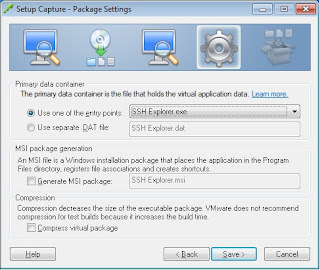 Although you can see guides for Thinapp for Virtualizing SW, i l illustarate settings for ssh explorer here in Section 1. you can off course modify many stages using other tutorials on thinapp. 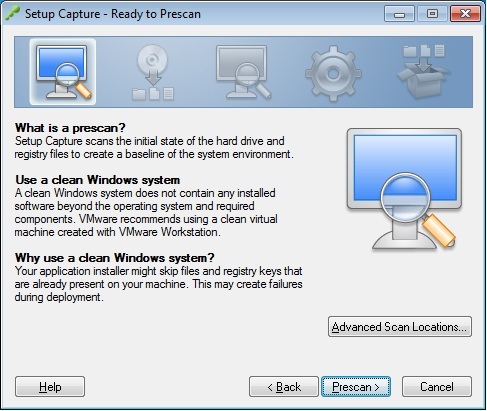 The applications are tested on Vmware workstation as well on the real system, I'll show the illustration on workstation only. 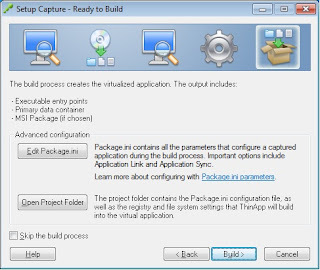 The main point that enables use trial SW for ever is that Thinapp allows us to store all the information that the application needs, wither registry/programfiles/settings etc in single directory. It is in a way similar to trick application that its still running in past by changing system date/using SW that makes it run in particular date. But many SW which synchronize with internet wont work in this fashion. 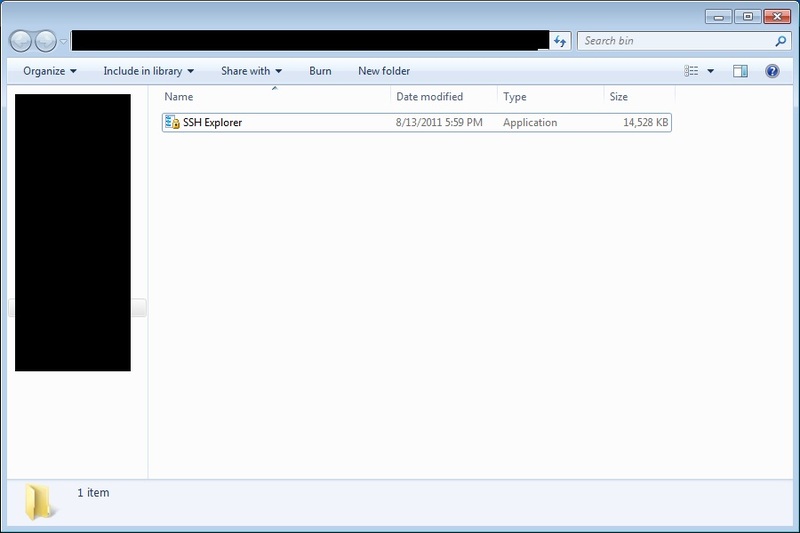 Install the application (in this case ssh explorer), don't close the thinapp window. 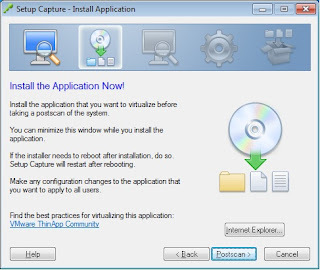 Select the entry point, off course for simple application you only want the application itself not the uninstaller and stuff. 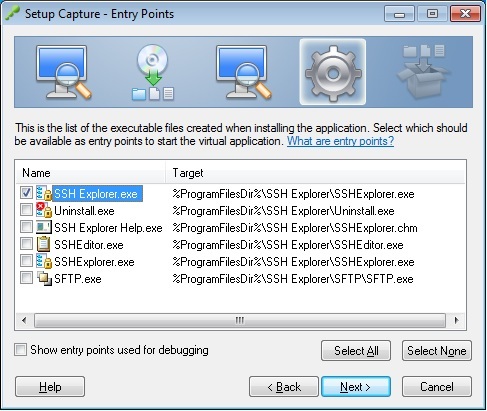 Entry point is the Exe that will be run when click the generated EXE. For products like adobe CS 4, you'll use multiple entry points. Here i use only one. 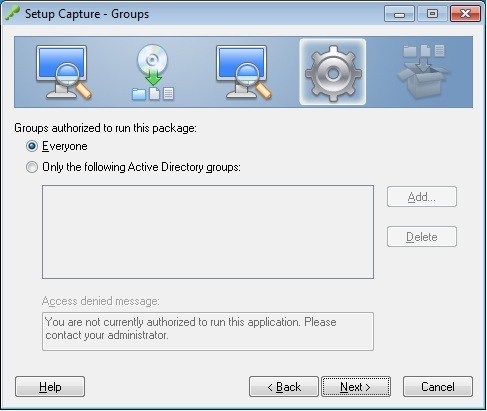 Enable all groups to run package (Or use a particular group if you want to). You dont want your application to write data here and there (offcourse for using trial unlimited), so use restricted write access. 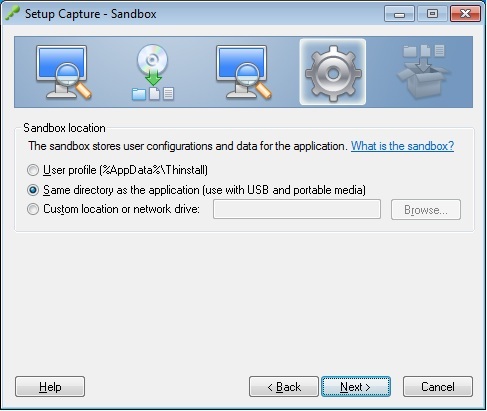 Now select same directory as application, this is again for the same reason, you will delete the application data folder as illustrated below (after saving settings). Inventory name is the folder were the generated Exe will be stored, and the application specific data will be kept of the final generated exe. Choose accordingly. Primary data container is read only file, so keeping it within exe does no harm. 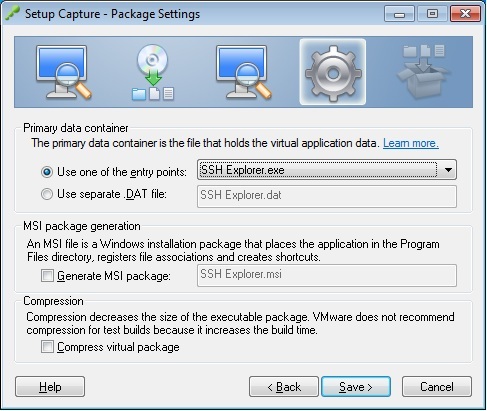 MSI is not generated in this case neither the package is compressed (might affect later performance also). 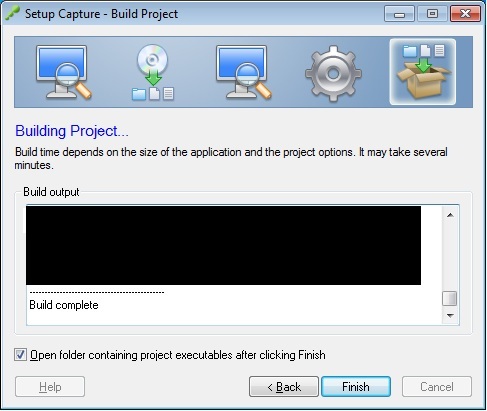 Click build to generate final single exe of entire application. Click finish to open folder to see the generated application and other files if you choosed them (here only single exe is shown). Now each application has its own data (like personal preferences, connection settings etc). You will need to look for the generated folder for the settings. Copy the files conn.ini ,settings.ini and snippets.ini for later use (you dont want to reconfigure the SW again). 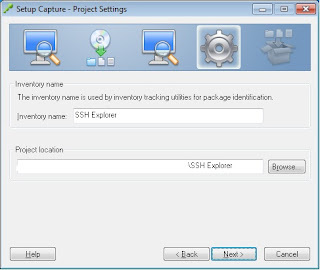 Delete the folder "SSH Explorer" , the folder you provided for Inventory name. All the registry and other settings will be erased. 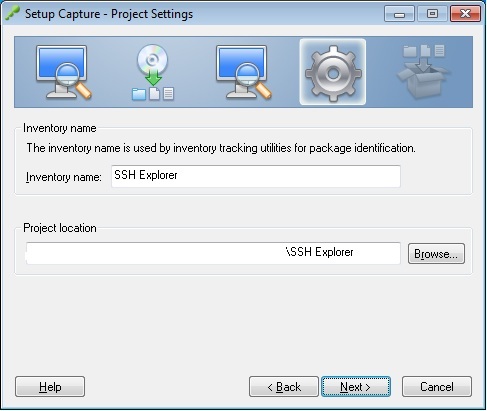 Start SSH Explorer again and you will have your folder recreated, replace the files we copied earlier. and voila you are done :). Similar procedure is to be followed for all other SW.
People. Simple theme. Theme images by enot-poloskun. Powered by Blogger.